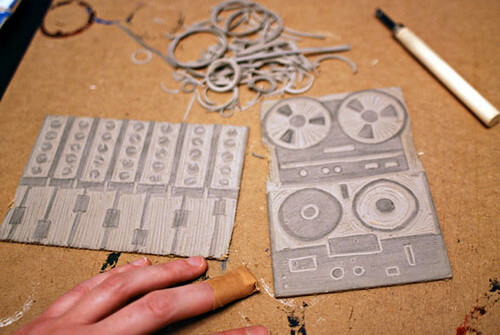 for pete’s birthday i carved these two music recording gear lino blocks and printed a bunch of shirts – 7 to be exact. 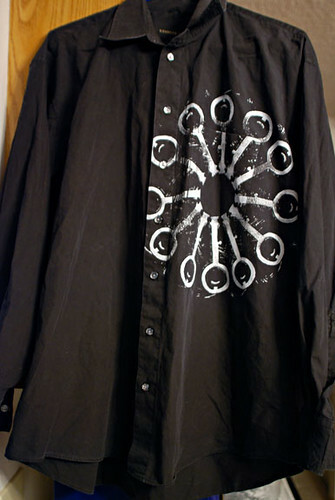 4 with those and 3 banjo shirts, including this one which is actually embroidered, not printed, that i posted about on threadbanger a few days ago. wanna see them all? ok! 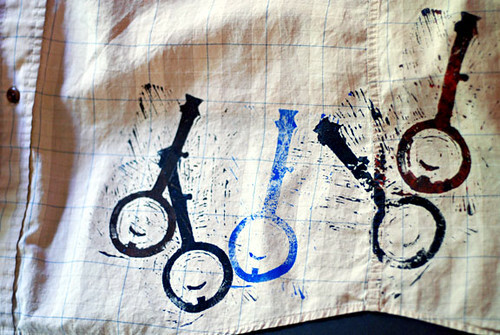 block printing is so much fun! i definitely plan to do much more in the near future! oh oh and my other bday present to pete was soo super nerdytastic! i made him a website! 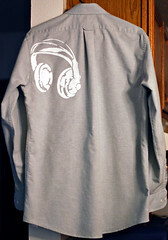 metalheadpete.com! it’s still very much work in progress… i just built the site template kind of, and then we’ll change/add stuff as we get to it. the music sample mp3s are all many years old – his new stuff can be found on the myspace page for now; it’s all incomplete, but still fun to hear. (don’t be scared by the word “metal” – it’s a very experimental kind of mixed genres music that i don’t know how to describe, but there’s no growling vocals or anything, at least not in the new stuff.) he’ll probably put up cds for sale on the music page in the future, so if you like what you hear, you might want to subscribe to his blog! one last totally random thing, since i’m on the subject of music… yesterday i was hanging out with star and scott and lauren and this question was asked: “if you could see any 3 people/bands play live, living or dead (or any 3 shows), who would they be?” so, i think mine are: the velvet underground with nico in ny when andy warhol was their manager, karen dalton + bob dylan + friends at a greenwich village coffeeshop in the early/mid 60’s, and the beatles apple rooftop show (last live show ever), but that last one is kind of tied with john+yoko post-beatles instead. i would list elliott smith if i hadn’t been lucky enough to have seen him once live, even if it wasn’t the best show to see him play (sunset street fair, so short set, huge crowd, not-great sound, etc). what are your picks?? i’ve had a superfun last couple of days! on thursday i was lucky enough to get to hang out with diane and rachel all afternoon, fun times! 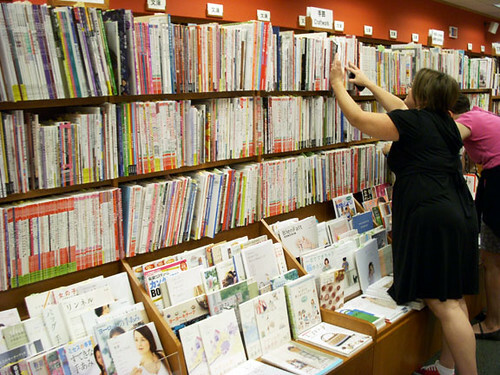 diane took us to the amazing kinokuniya bookstore inside uwajimaya in beaverton. that’s not even all the craft books! 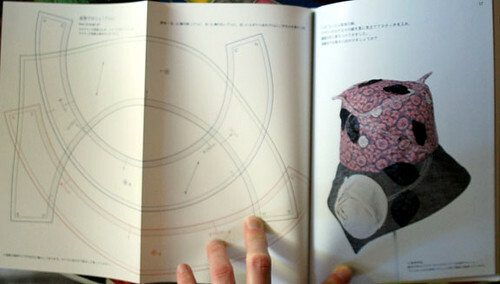 so, backing up, i had listened to diane’s podcast about japanese craft books long ago, and i was intrigued, but never really looked into it, because, you know, it’s not like i needed one more crafty thing to get into or spend money on. well, holy crap, they are incredible! i am a huge fan now, whether i like it or not. i am not really an amigurumi or softies person – i think they are cute, but don’t have much of a desire to make them – so that’s part of why i didn’t think japanese craft books would be for me, but that was super stupid of me, because there are tonnnns of knitting, crochet, garment and accessories sewing, embroidery (rachel scored an amazing book on embroidery sketching), and much much more. i was drooling over a couple gorgeous books on buttons (susan, you have to see these if you haven’t already!) 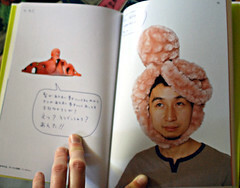 and even the crafts i wouldn’t want to make myself were shot and styled so beautifully that i wanted every single book! seriously, oh my god they are gorgeous. now onto my purchases! 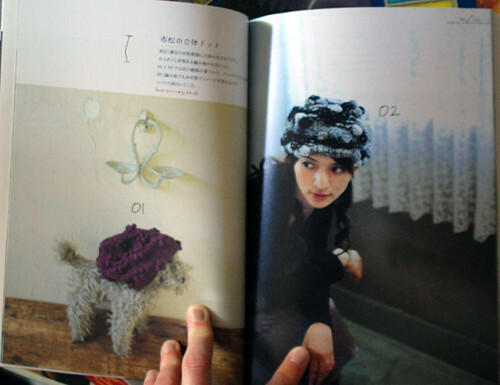 i limited myself to 2 books (they are not exactly cheap), and they are both hat books – one knit/crochet hats and one sewn hats. i’ll let the pictures do the talking before i say anymore…..
like i said to diane and rachel about that second book, i think it’s pretty much the best thing that ever happened to me. you can expect to start seeing some leethal hats inspired by some of those designs starting very soon, like hopefully tonight! 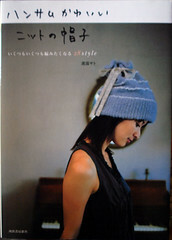 i couldn’t find any (english language) info on either book by searching the isbn’s, but if you want to try to track them down the knitting book is: isbn9784309281094 and the sewing one is: isbn9784579111657. 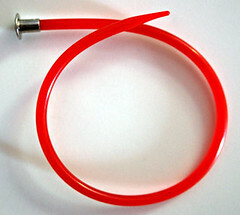 in other book news, while pete was blowing some birthday money at powell’s yesterday, i picked up a knitting book i’d been eyeing for awhile: loop-d-loop by teva durham. i don’t knit many things from patterns (other than my own) but there are several designs in here i love and i plan to try out at least a few of them. 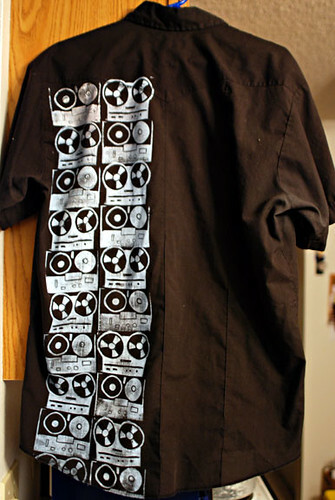 if you’re a raveler, check it out here… i like this one and this one and i love this but i doubt i’d ever make it. 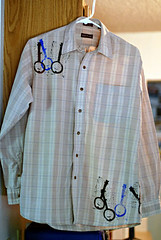 new leethal recycley fun stuff! 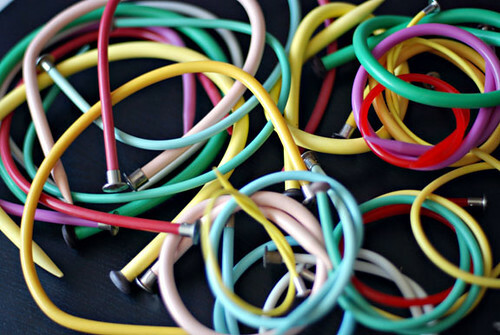 so you may have seen my threadbanger post a couple weeks ago about melting vintage knitting needles into jewelry… well, if you don’t want to try it out yourself, i now have my store stocked with necklaces and bracelets! 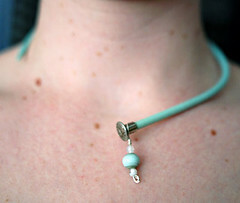 each necklace comes with a custom matching recycled paperclip + vintage beads stitch marker pendant, and the bracelets are made to hold stitch markers like charms, making them super useful for knitters. i’m keeping the prices low because, well to be totally honest, i have broken a couple already… they don’t break super easily, but they do snap if you’re not careful, so yeah… i’m hoping low prices will prevent any angry customers. another thing that worries me a little is this incident. 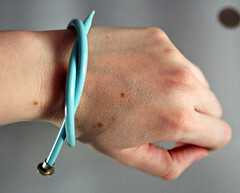 from what i can gather, someone out there believes that this needle bracelet idea is their original concept, which is totally ridiculous because it’s the same thing as toothbrush bracelets, which of course have been around forever, and no one can claim they invented the concept of melting plastic. 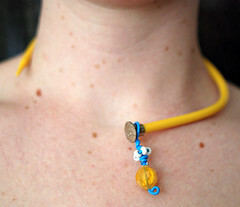 so… by selling these, i am most definitely not saying they are my idea (although, i have not ever seen needle necklaces anywhere), and i am encouraging people to make their own, but throwing some up for sale for anyone who would rather just buy one cheaply from me instead of diy-ing it. 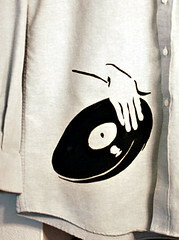 just like my record bowls, same thing, diy if you want to, buy from me if you don’t. yeah? hope that’s cool with everyone! 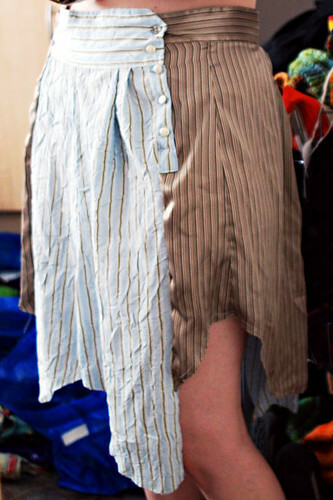 skirt from recycled shirt sleeves! 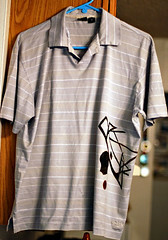 i got the idea from here, but i just used the shirt sleeves concept and improvised, not being much of a tutorial-follower. 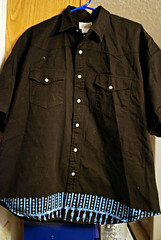 what i didn’t think of though, was that using the two sleeves of two shirts wouldn’t work how i imagined it would, since the buttons on right and left sleeves are on opposite sides. 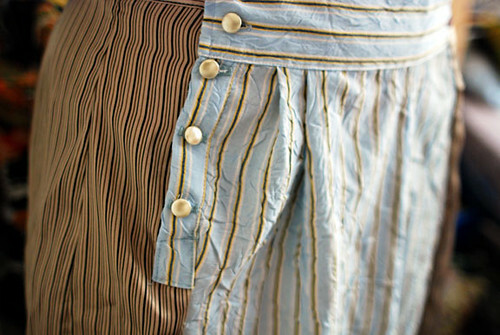 so, the buttons would only close on two of the four seams on my skirt. 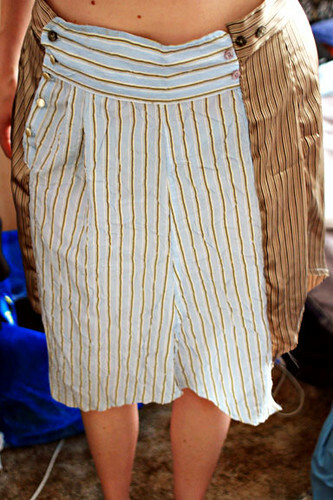 since the skirt ended up being a bit smaller than i’d prefer – sitting on my natural waistline instead of more down on my hips – just the two buttons wouldn’t allow me to get the skirt on, so i added the extra button band up the one seam. 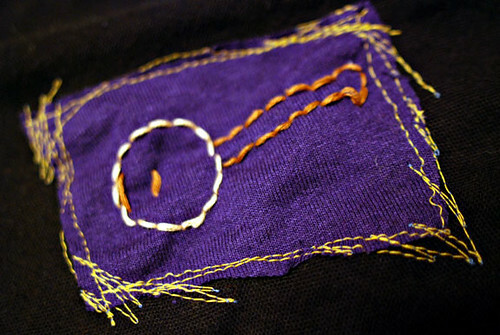 i left the bottom just as the sleeve shapes were, adding a single straight stitch around the edge to prevent fraying. i might have chopped the whole thing to give it a straight-across bottom, but the highest point is higher than i’d want it. 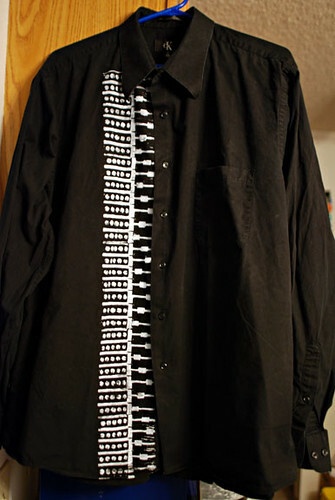 i’ll probably make another one in the future, using 4 different shirt sleeves, from longer/larger shirts, and cut the bottom straight across. 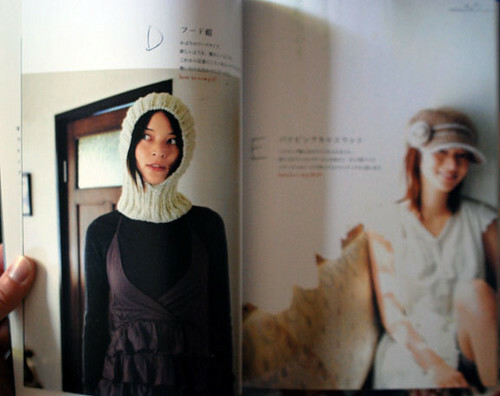 in other news, i’ve been working hard on two new knitting patterns. 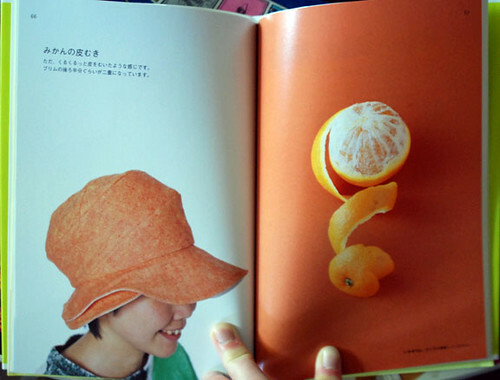 no clues, except that one is a hat and one is not! 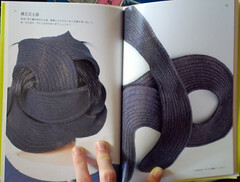 and speaking of knit designing, i am on serious pins and needles waiting to hear if i’m in the fall knitty! i know that at least one designer was notified that she’s in so i figure i could be hearing any minute now (or possibly not for another month) so it’s hard not to be thinking about it constantly! 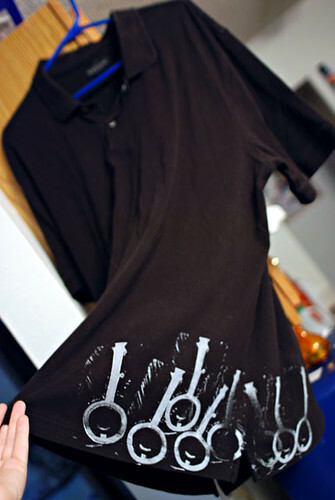 turning boring shirts into superawesome custom shirts! 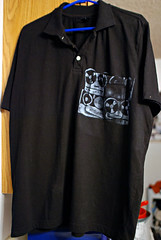 i had so much fun with the block printed shirt that yesterday i made a couple for myself! if you want to try out some printing now, i did a threadbanger roundup awhile back with links to tutorials on every different fabric printing technique i know of. 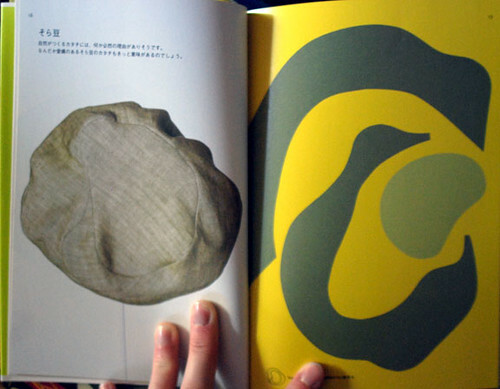 and a couple weeks ago i picked up lotta jansdotter’s new printing book – so inspiring! i recommend checking that out for ideas with tons of different methods, from potato printing to screens. 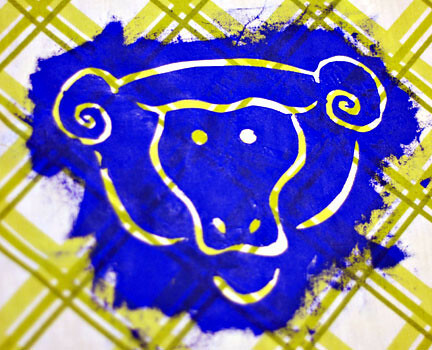 and, if you are in the portland area, i will be teaching a class on freezer paper stenciling at the 100th monkey studio! 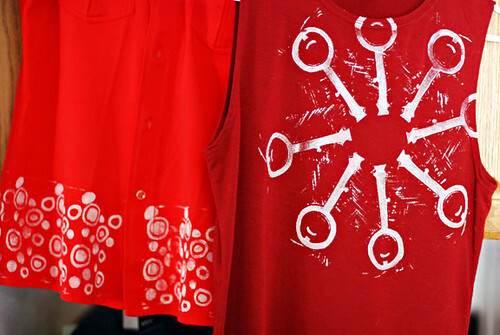 on august 2nd i’ll be teaching how to make a stencil, and print both the positive and negative images. i think it’ll be a great class for teenagers who might be new to crafty things, so if you know anyone who might be interested be sure to let them know! all kinds of wooly goodness! and i love all of them! woo! all 5 are for sale now, see the yarn page for yarn details and stuff. 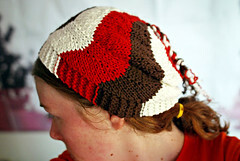 next saturday i’m teaching a class on my short-rows wavy hat pattern at twisted. 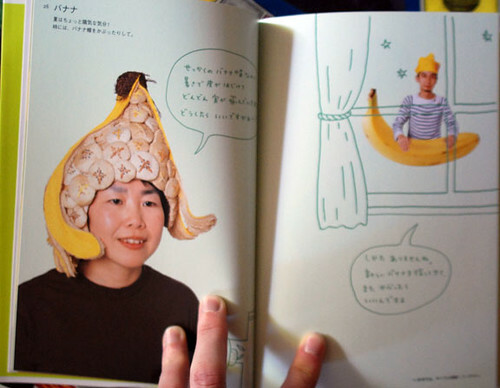 and look, it works great in cotton! 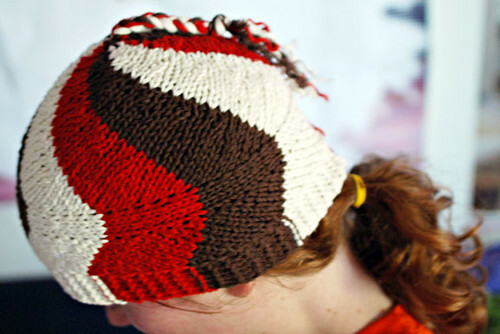 the class is listed as intermediate, but i think it’s a perfect project for an adventurous beginner – someone who is comfortable with knit and purl but doesn’t necessarily know anything else. 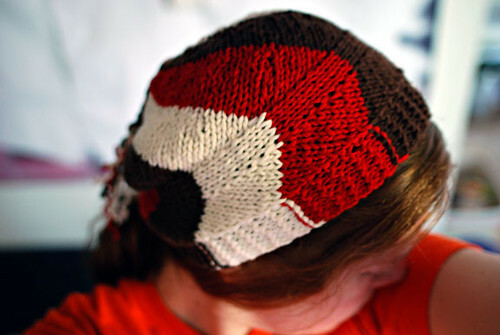 i think most knitters who follow my blog would be fine to knit this pattern without a class, but if anyone has a friend who is just starting to get into knitting and needs some one-on-one help to understand provisional cast-on, short-rows, grafting, etc… it would be fantastic if you told them about the class! this newest version that i just finished is three different recycled cottons from unraveled sweaters. 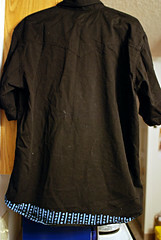 it’s really slouchy and can be worn pulled down or pushed back, which i like better for summertime. i changed colors at the top of each wedge, leaving long ends hanging at the top, then braided all the ends together instead of picking up stitches around the top to close it. this meant less work finishing the top and zero ends to weave in!! if you hate finishing, this is the way to go! in celebration of the 4th, i did a short post yesterday for threadbanger about revolutionary knitting, and i want to get into it a little more here. i’ve been reading a lot about the history of knitting and spinning lately (here and here and here and here and more) and one of the most interesting parts to me was the role knitting played in the colonists’ fight for independence against britain. with a ban on imported british goods, women organized huge spinning and knitting groups, struggling to keep the colonists all clothed and warm without the help of british yarn or clothing. they were fighting to proove they could sustain themselves on their own work and creativity. i don’t know about you, but i feel a connection to this concept thinking about today’s diy culture, particularly with regards to clothing reconstruction. 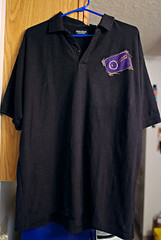 to me, buying used clothes at thrift stores and making them your own is a total revolt against consumer culture, unfair labor, commercialism, and uniformity. we may not have the same kind of unjust ruling nation to rebel against, but we definitely have malls, sweatshops, and, well, boringness to protest through our own diy revolution! 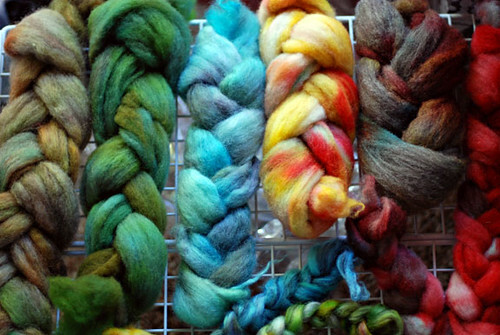 and now in fibery news… last week pete was out of town for a couple days and i took advantage by dyeing up tons of fiber! 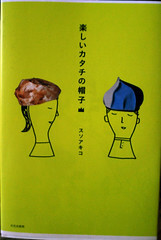 (he hates the smell of vinegar and wet wool, isn’t he crazy?) this was in preparation for tour de fleece!! i’ll be spinning in the tour every day starting tomorrow through july 27th! 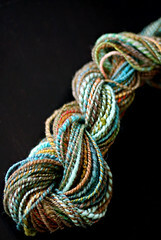 also in prep mode, i splurged and bought intertwined (gorgeous!) 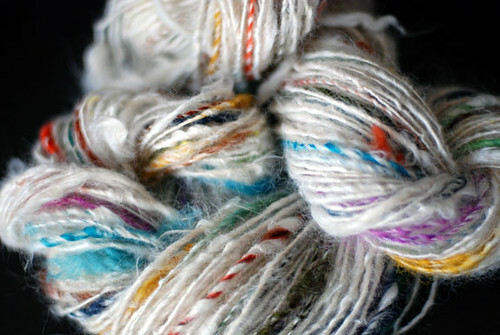 and spinning designer yarns. 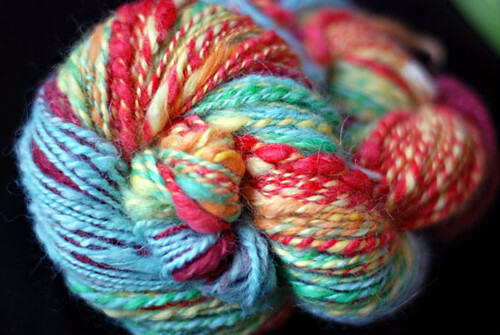 i plan to try tons of new art yarn techniques, so exciting! 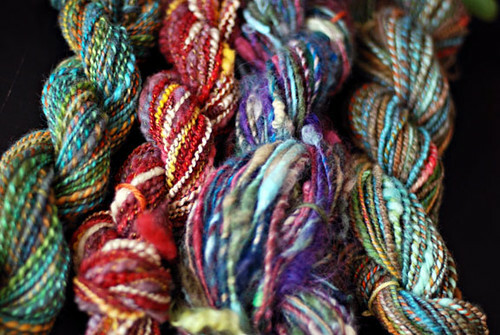 so if all goes well, you’ll be seeing about one skein per day of new leethal handspun yarn for sale, probably bunched together in big updates once or twice a week. 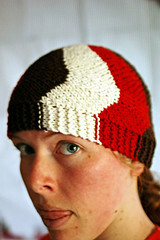 for now, i do have one new yarn up! 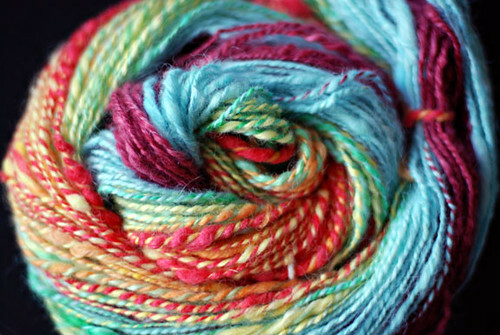 this one is 100% alpaca, hand-dyed rainbow colors, 2-ply, 125 yards! that’s a lot of yardage for me, usually my handspun skeins are around 50-80 yards. 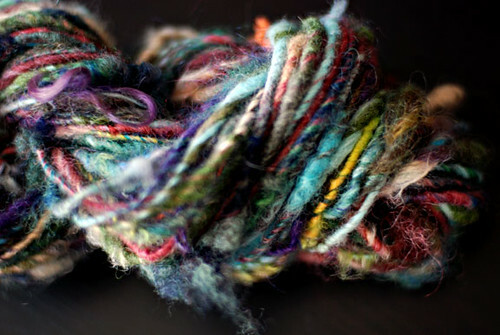 it’s a crazy, lumpy, bumpy, thick+thin, weird self-striping yarn – it’ll start at one end with solid purple, then blend to solid blue, then it’ll be a blue/green blend, then green/yellow, yellow/orange, and yellow/red at the other end, ending with a tiny bit of red/orange. ok i have tons of other stuff i want to share with you, it’s been building up. so i’m planning to (hopefully) post more often, at least 2-3 days a week, to catch up and then stay caught up. hope everyone is having a fun 4th!